Alfa Wear Oy is founded in 2008 and has established significant foothold in Finnish market for textiles and clothes for health care and food industry. Our decades of experience, effective and reliable network of international partners guarantees our competitiveness and competence for long term cooperation with both private and public sector. From the beginning we have operated responsibly, sustainably and profitably. 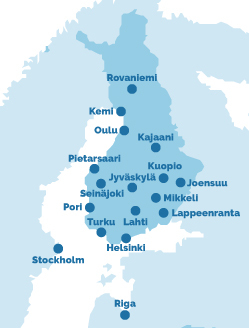 With fast growth and success we have gained recognized position in Finnish market. In 2011 Alfa Wear was granted Kauppalehti Achiever Certificate for the first time. Reliable and effective logistics is vital cornerstone for our service and success. Timely and promptly delivered materials directly to the start of production process as well as shipments from the end of production directly to our customers ensure our reliable, streamlined and cost-effective. Our efficient production partners in the Baltics provide us flexible production capacity for orders of versatile volume and specifications. Impeccable chain of operations with network of partners guarantees constant competitive performance. Key elements to ensure quality and comfort of our products are correct materials and reliable production partners and methods. Materials we use are designed for workwear and certified for industrial laundry. They come from internationally recognized suppliers and are proven to withstand hard-wearing condition. Materials are Öko-Tex certified. Production is standardized and controlled to guarantee products meet requirements of people working in our garments. Our high quality products are washable in industrial laundry. Alfa Wear Oy, all it’s partners, suppliers and subcontractors comply with ILO resolutions including the laws of the applicable legal systems of respective country and sustainable business ethics and social responsibility.